Friday just became that much more amazing. One Direction's "Drag Me Down" music video is officially available for everyone to watch on repeat. What a glorious day, right? Now all those die-hard 1D fans can watch Harry Styles, Liam Payne, Louis Tomlinson, and Niall Horan in their very first video without fellow band member Zayn Malik. As sad as that might be, don't let it get you down, because the video has all kinds of sentimental value. 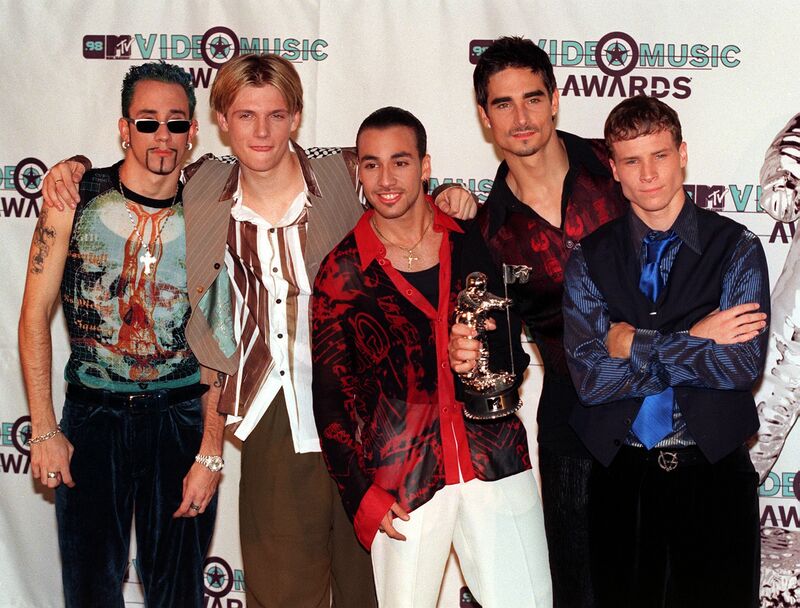 For example, did you notice that "Drag Me Down" is just like the "I Want It That Way" video from the Backstreet Boys? That's right, 1D channelled their inner BSB in several ways, which I'll explain in a second. First, let's discuss the fact that the Backstreet Boys love One Direction's new video. For real. The '90s group that stole my heart throughout elementary and middle school can't get enough of the latest and greatest boy band. On Friday, BSB tweeted, "love the video! cheers @onedirection." As you can see below, they also included a space shuttle and an airplane emoji. Yep, Nick Carter, Brian Littrell, Kevin Richardson, A.J. McLean, and Howie Dorough see the similarities between "I Want It That Way" and "Drag Me Down," too. With that said, let's get to it and showcase the several similarities between the two music videos. No boy band member is left out, as each one has their very own solo. That's right, we get to watch each singer from 1D and BSB shine. These videos are all about inclusion and what's better than that? One Direction is all about that NASA space shuttle hangar, while BSB can't get away from those airplanes. No one has ever boarded a shuttle or airplane better than 1D and BSB. They sure know how to make something simple look good. They both do the dramatic group walk. Neither music video would be the same without it. Is your mind blown? There are a some differences, of course, including the fact that One Direction did not include their fans or name a NASA shuttle after themselves. Oh well, both are great boy band videos. Now excuse me while I go watch 'em on repeat.